Over the summer, Families Empowered, a nonprofit group that helps Texas families navigate their school choice options, revealed an eye-popping number. For the 2017-18 school year, San Antonio families submitted nearly 40,000 applications to the city’s three largest charter school networks: Great Hearts Texas, KIPP San Antonio (now KIPP Texas), and IDEA Public Schools. Six years ago, those networks combined enrolled some 800 San Antonio students, according to Choose to Succeed, a group working to attract charter schools to the city. Today, the organization puts the number of students in schools it supports at 16,600. The goal is 60,000 by 2026. With 1.5 million residents, San Antonio is already the seventh-largest city in the country and is estimated to grow by a million more people in the next 10 years, says Choose to Succeed CEO Christopher “Chip” Haass. Opinions about school choice notwithstanding, what these numbers add up to is a tidal wave of change aimed directly at one of the nation’s fastest-growing and yet most economically divided cities. An unconventional leader, San Antonio Independent School District Superintendent Pedro Martinez has responded by engaging his would-be competitors, creating in-district charter schools that are proving wildly popular, making sure the most impoverished kids are fairly represented in them, and asking everyone to push toward the same goal as the charter schools: making sure all students are college-bound. A year and a half ago, Ambika Dani arrived in this volatile landscape, intent on opening a public charter school. Her plan was for Promesa Academy Charter School to serve elementary-age pupils in the city’s most impoverished zip code. Four of the nine elementary schools located in the 78207 are on the state’s failing list, and almost half of residents 25 and older did not graduate high school. Despite the neighborhood’s need for better schools and the public demand for alternatives, the Texas Board of Education this year turned down 17 applications for new charter schools throughout the state. Dani’s was one of four approved — and the only one in San Antonio to get the green light. When she first visited the 78207, the 28-year-old Dani says, she was shocked to see poverty that looked a lot like the countries she grew up in, Nigeria and India. “A poverty I believed didn’t exist in the United States,” she says. Dani’s family lived in Lagos, Nigeria, until she was 13, when they moved to Bangalore, India. She went to international schools — top-notch programs featuring International Baccalaureate classes and other high-level programming, such as the Cambridge International Examinations, that remains the same from country to country. In Lagos, Dani was one of 20 students who came from some 15 countries. She learned to love both math and the perspective-altering experience of getting to know other cultures. It made sense, then, that Dani became a math teacher for THINK Global School, a traveling high school that exposes students to four countries a year. She went on to teach in several U.S. cities, including New York and Pittsburgh, eventually following her medical-resident husband to San Antonio. Dani was learning about the city’s education scene when she heard she had been selected for a Building Excellent Schools fellowship. The Boston-based program would give her intensive, year-long training to open a public charter school, which she decided should be located in the 78207. The community is rich with art and history. But in contrast to her global background, many of the parents and children she met had never traveled outside their neighborhood, much less to other cities. Dani says Promesa — Spanish for “promise” — is her commitment to trying to change that. To that end, when the school opens in fall 2019, it will feature global studies, among other things. Dani isn’t the only San Antonio transplant who was astonished to learn about the 78207. Martinez, who arrived here from Nevada in 2015, grew up in a struggling part of Chicago’s South Side with a father who never made more than $7 an hour. Like Dani, he fell in love with the neighborhood’s vibrant culture even as he struggled to comprehend the depth of its poverty. After taking the measure of the district’s challenges, Martinez set a two-pronged strategy into motion. Borrowing the better charter schools’ strengths, he created magnet schools and other innovative schools with attractive academic themes like Montessori and dual language programs. And he reached out to local and national charter school operators and teacher-training programs and asked them to help run some of the district’s most challenged schools. At the same time, he launched a radical socioeconomic integration plan to end the isolation and low expectations imposed on his district’s poorest students for generations by reserving seats for them in the sought-after new schools. He identified poverty rates on every block in the district and used that information to create a system for enrolling students equitably. The combination of strategies garnered some quick successes, drawing national attention. District leaders from around the country in February descended on San Antonio to hear from Martinez and his team and to tour their schools. Last spring, as Dani’s charter school application was in the final stages of an uncertain approval process, San Antonio ISD’s board approved Martinez’s proposal to ask Democracy Prep, a New York-based charter school network, to take over a chronically poor-performing district elementary school that was otherwise facing closure. Seemingly overnight, the same kind of political battles that have attended the arrival of high-performing, typically non-unionized charter schools in other communities commenced — at full boil. Like many places, San Antonio didn’t have many of the independently run public schools for years after Texas’s first charter school law was passed in 1995. Those that did open up in the early years tended to be mom-and-pop startups or programs intended for dropouts and other small groups of students. Some were good, some were not, and neighboring traditional school districts for the most part took little notice. In 2009, a woman named Victoria Rico visited one of what were then KIPP San Antonio’s two public charter schools. A lawyer and the product of a family with a legacy in the city’s philanthropic community, Rico had been appointed to the board of the George W. Brackenridge Foundation, whose sole area of giving was K-12 education. Like many schools affiliated with other charter management organizations — nonprofit networks with three or more schools — KIPP schools frequently outperform their traditional district counterparts. Last year, Stanford University’s CREDO researchers found that networks like KIPP do particularly well with black and Latino students living in poverty. Rico was blown away by what she saw at the school and began visiting other charter schools that were successfully replicating — opening new campuses where students were enjoying high academic growth. In December 2011, Rico invited leaders of the charitable network Philanthropy Roundtable and several high-performing charter school networks to two meetings in San Antonio. The city’s private and family foundations could make a greater collective impact if they joined forces to help underwrite new charter schools, she told them. Meanwhile, the school networks could collaborate to achieve economies of scale. The outgrowth of those meetings, Choose to Succeed, courted not just charter networks that served impoverished students but also groups that appealed to middle-class families. Bare-bones state funding for all schools, including many in wealthy communities, had sparked dissatisfaction among affluent parents, which translated to demand for schools affiliated with Arizona’s BASIS Schools, regularly named among the best high schools in America, and Great Hearts Academies. In his 2016 book The Founders, which was published by The 74, Richard Whitmire wrote about Rico’s plan, observing that as of 2015, the new schools had attracted a remarkably socioeconomically diverse array of families. A third of families at the first two BASIS schools were white, he reported, and another third Latino. Half of students at Great Hearts’ downtown Monte Vista campus are Latino, and a fourth are low-income. “It was clear the one action that could truly shut down the charter expansion — creating successful traditional schools for low-income Latinos at scale — was not in the offing anytime soon,” Whitmire wrote, while taking note of an incipient “attitude reversal” at San Antonio ISD, which had a new superintendent. Under state law, the district had long had the ability to create or oversee charter schools, something it had done numerous times. Opened in 2008, for example, Young Women’s Leadership Academy, an all-girls high school with an admissions test, repeatedly has been cited for high student achievement by both the state Department of Education and U.S. News & World Report’s Best High Schools rankings. The new superintendent, Martinez, began asking teachers if they wanted to open more in-district charter schools where a certain number of seats would be open to the same affluent families living outside San Antonio ISD who were flocking to charters. The rest of the student body would come from in-district students living in different levels of poverty, to make sure that San Antonio ISD’s poorest families had the same access as those who were on the threshold of the middle class. The first, a gifted and talented school that didn’t screen kids academically and was open to anyone, acquired a buzz on the parent grapevine overnight. Advanced Learning Academy was followed quickly by a Montessori school, dual-language immersion schools, two schools managed by the Relay Graduate School of Education — a teacher-training program founded by veterans of the high-performing Uncommon Schools and KIPP charter school networks — and numerous other magnet programs and in-district charter schools. Suddenly, several San Antonio ISD schools had as many applications as the most popular charter schools. The influx of students from neighboring districts began to counter the loss of families enrolling their children in schools outside the district. Martinez also approached a small San Antonio charter network that operates schools for youth in residential settings, including treatment and detention centers. He asked the John H. Wood Charter Schools to take over the district’s moribund facility for its high school students with the most challenging disabilities and behavior issues, and invited the Dallas-based Texans Can Academies to open a program inside a high school for students who have dropped out or are far behind on graduation requirements. Local philanthropy took notice, particularly of Martinez’s plan to hire college counselors and ask leaders of the lauded KIPP Through College program to train them to use the charter school network’s strategies, which have dramatically increased the number of KIPP graduates enrolling in and graduating from four-year colleges. A KIPP counselor spent the 2016-17 school year working in a district high school. Thanks to the experiment, the number of graduates from Jefferson High School accepted into four-year universities doubled, from 26 percent to 53 percent. 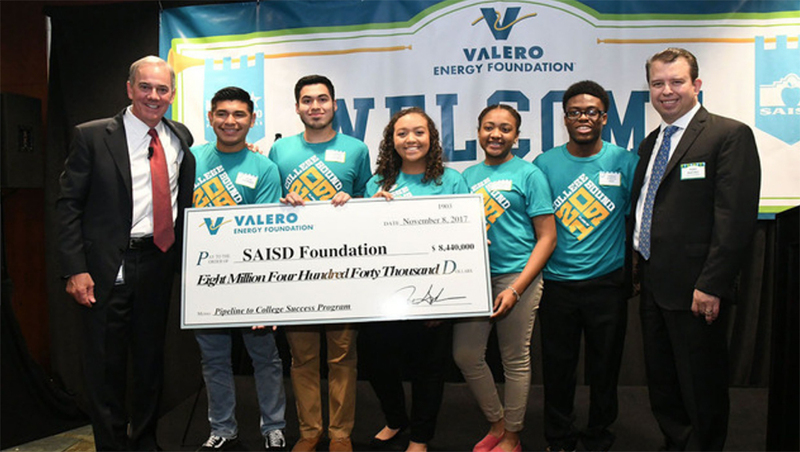 In late 2017, Valero Energy, an oil refinery giant that is headquartered in San Antonio, gave the district $8.4 million over five years to hire two college advisers for each high school and one for each of the smaller schools. The staff supplement school counselors, helping to match students — virtually all of them the first in their families to go past high school — with colleges and universities that will support them academically and financially. The class of 2017 had the district’s highest graduation rate ever, 85 percent. More than 55 percent of those graduates are attending college this year, and the number attending Tier 1 universities doubled to 7 percent. Students are attending Middlebury College in Vermont, Boston College, the University of Michigan, and other highly competitive schools. The Texas supermarket chain HEB, whose family owners are deeply involved in K-12 education in the state, meanwhile, played a major role in creating CAST Tech, a high-tech high school located in San Antonio ISD that is open to students throughout Bexar County. At the end of its first year, CAST earned a 2017-18 “distinction” rating from the state based on its superior student performance in relation to similar schools. The other thing he says education policymakers have noted: Martinez’s willingness to work with the state. To fulfill its requirements under 2015’s federal Every Student Succeeds Act, the state boosted its support for in-district charter schools, which has meant extra funding for San Antonio ISD schools. The district will get extra support, for example, to help the New York-based Democracy Prep turn around a school that had been on the state’s list of the lowest-performing programs, Stewart Elementary. Buzz and stronger academic outcomes notwithstanding, district enrollment continues to fall. The 2017-18 school year opened with 1,800 fewer students than the year before. And the 2018-19 school year is expected to see enrollment drop by another 800 students, from 50,695 to 49,895. Martinez attributed the departures to the presence of charter schools within greater San Antonio. But co-opting them, he believes, will better serve students than digging in and trying to vanquish them. The 2017-18 enrollment losses were a major factor behind a $31 million budget deficit forecast for the current year. When the administration started looking at spending, Martinez said, analysts concluded the district had 255 more teachers than were needed in its 90 schools. In May, the school board agreed to lay off 31 administrators and 132 teachers. Sixty-nine were probationary teachers who had one-year contracts. The others were laid off on the basis of performance evaluations, sparking protests and angry calls for the board to fire Martinez. Flyers with the superintendent’s picture and slogans such as #byepedro already had appeared throughout the city, sparked by the board’s decision in March to sign a contract with Democracy Prep to take over Stewart Elementary. Under the terms of a relatively new law, Stewart was projected to become one of the first San Antonio ISD schools to trip a requirement that the state either close a school that remained on its lowest-performing “improvement required” list for five consecutive years or take over its district’s board. Districts can forestall those actions for two years by turning over the school in question to a charter network, nonprofit agency, or university to run. But here, too, something largely unprecedented happened. Families — including some affluent parents who just a couple of years ago were reluctant to enroll their children in San Antonio ISD schools — showed up to support the superintendent and board members. They had hashtags of their own: #parentsforpedro and #padresforpedro. It might surprise most people to learn that, reputation as a free-market frontier notwithstanding, Texas is an incredibly hard place to open a charter school. The politics are cutthroat, funding laughable, and scrutiny so intense that applications routinely top 100 pages. In December 2017, 21 prospective new schools applied for permission to open. In June, after a six-month vetting process that the state’s education commissioner termed “a thrasher,” Dani’s Promesa Academy squeezed through the tiny end of the approval funnel. Debate was intense right down to the wire. One state Board of Education member, an administrator at a San Antonio-area district adjacent to the 78207, opined that the area was “oversaturated with charter schools.” Another opposed Promesa because Building Excellent Schools, the nonprofit where Dani was a fellow, receives money from the Walton Family Foundation, the nation’s largest philanthropic funder of charter schools. Because San Antonio ISD will authorize Democracy Prep, Stewart Elementary’s new leaders will not have to navigate the same procedural gantlet. But it’s anyone’s guess whether Martinez’s desire to partner with would-be competitors will provoke enough opposition to spell the end of his much-watched tenure. Martinez began his career in education in Chicago Public Schools, arguably the epicenter of pushback against school choice. His experience there, he says, suggests that the success of the in-district charter schools opened on his watch — and their long and diverse waiting lists — may help mitigate people’s discomfort with change. Read other installments of this series, as well as other recent coverage of school segregation and district integration efforts, at The74Million.org/Integration. Disclosures: The George W. Brackenridge Foundation provided financial support for this project to The 74. The Walton Family Foundation, Bloomberg Philanthropies, Carnegie Corporation of New York, the Bill & Melinda Gates Foundation, The Eli and Edythe Broad Foundation, the Doris and Donald Fisher Fund, the Charles and Lynn Schusterman Family Foundation, the Karsh Family Foundation, and Jon Sackler provide financial support to both KIPP and The 74.